This archive holds all posts form May 9, 2009. 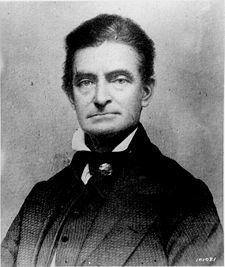 John Brown, the fiery white abolitionist and anti-racist was born on this day, in 1800. Virtually all historians and analysts who have dealt seriously with Brown have accented his militant actions against U.S. slavery. Yet Brown was also a man of ideas–in the long tradition of thinkers who have articulated the great ideals of freedom, justice, equality, and human rights. In the West one of the first major thinkers in this freedom-loving tradition was the English figure, John Locke, who had an influence on the thought of North America’s influential philosopher of freedom, Thomas Jefferson. Yet both Locke and Jefferson were heavilyg involved in and supportive of the anti-freedom slavery system. While white Europeans like Jean-Jacques Rousseau articulated strong critiques of slavery, before Brown no other white Americans had lent their pens, in a major way, to the effort for the destruction of slavery. Brown presented his ideas in letters, circulars, agreements, and interviews. There he often uses phrases like “struggle for liberty,” “friends of freedom,” and “lovers of liberty and human rights,” placing himself squarely in the tradition of radical theorists of democracy. Brown goes well beyond the ideas of virtually all the white thinkers of his day by extending the ideas of freedom and human rights to enslaved African Americans. Brown saw beyond the moral and political strategies of the abolitionists to the need for more aggressive, armed actions against the brutal system of slavery and the governments that upheld it. Thus, he organized a major raid on the arsenal at Harper’s Ferry, West Virginia, with the goal of arming enslaved African Americans to pursue guerilla warfare against the totalitarian slavery system on which this country was founded. Once caught, he continued to assert his ideas on freedom and liberty. At his November 2, 1859 address to the court that sentenced him to death for the Harper’s Ferry raid, Brown spoke of the golden rule guiding him to speak and work for the “despised poor” and of his commitment to “forfeit my life for the furtherance of the ends of justice” and to mingle his blood with “the blood of millions in this slave country whose rights are disregarded by wicked, cruel, and unjust enactments.” Does this sound like the “wild” and “crazy” man that we are taught about in school? And where is his big monument in DC? Where is that monument to all those, black and white, who fought bravely against the 246-year-old slavery system?